← Drum roll, please! Ten-Thousand Years or More. 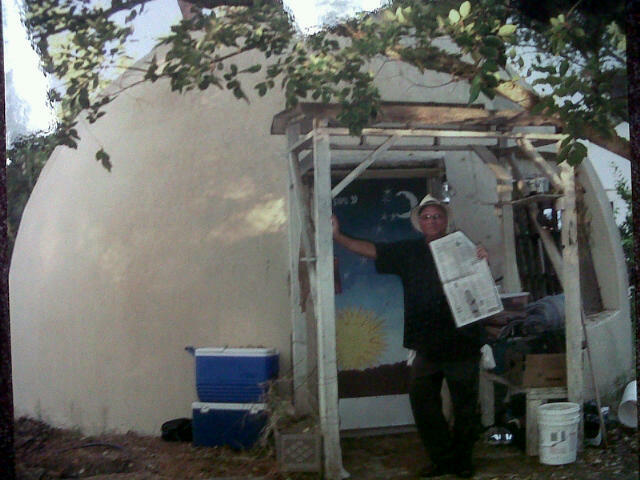 Recent photo of Clay in front of his old dome, #10 Baggins End. (Davis Enterprise, Letter to the Editor, March 17, 2011) As a UC Davis student in 1972, I had the unforgettable experience of helping to build the domes. I lived there until I graduated in 1975. That experience of self-reliance and community-living shaped my life. Since 1972, the domes at Baggins End have served as home to an ever-changing community of creative, odd, fun, innovative, and eclectic young people — or COFIEs for short. This student-built housing community is as unique as the people who live there. Without the domes and a few other little havens for the COFIEs, Davis would be a very dull place indeed. For these and other reasons, the dome community at Baggins End on the UC Davis campus is worth conserving. This entry was posted in Domes, UC Davis and tagged Domes, UC Davis. Bookmark the permalink. Yes yes!! Hang on to your hippies Davis!! !